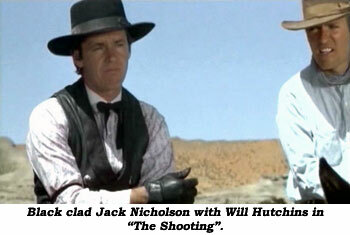 Will Hutchins with more on "The Shooting". Hey, Boyd. What’s WC’s official position on “Treasure of Sierra Madre”? Is it or isn’t it? A western, that is. It’s got all the makin’s. Heads it’s an action-adventure—Tails, it’s a western. Call it. Tails—yahooo! A western it is—one of my favorites. Saw it again t’other night on TV, and it’s as thrilling as ever. Walter Huston wins my all-time best supporting Oscar. Son John Huston was at the top of his game. To me, his big talent was adapting great books to the screen and remaining true to the author’s intentions—“Maltese Falcon”, “Red Badge Of Courage”, “African Queen”, “Asphalt Jungle” come to mind. ‘Course, some of todaze revisionist critics put him down, but the late, great James Agee loved him. Jean Sibelius, the Finnish classical composer, once observed, “No one ever put up a statue in honor of a critic.” In “Treasure”, Huston cuts to the bone of B. Traven’s masterful study of guns, gold, ‘n greed. He etches a tragic tale laced with brutal, sardonic humor that will remain in the blurry souls of us insomniacs for as long as the late, late show’s on the tube. Traven wrote unique, gritty dialogue. Huston captured the style perfectly with slight alternations to conform to the censor’s code. “Badges?! We don’ need no stinkin’ badges! !” Wild, huh? So was the dialogue in “The Shooting” written by Carol Eastman (alias Adrien Joyce). One critic wrote, “I didn’t understand a word Will Hutchins said.” Ditto. I learned it by rote and intoned it like a foreign language with appropriate gestures. I’m slow of study, and I spent most of my ‘paid vacation’ up in Kanab, UT, poring over my script while others took in the majestic scenery, argued politics, or got plumb drunk. We’d jump start each dawn at Rosie’s Diner on Mocha Java strong enough to float a bullet. I’d slip a fast nickel into the jukebox and play Chet Atkins’ “Cloudy ‘N Cool”. My sainted ex, Antonia Christina, would accompany Chet by performing a pseudo-Arabic dance to the haunting melody—while seated! Took us an hour to drive out to location—maybe longer—I lost track. I was learnin’ my lyrics. When we arrived we were rarin’ to go, no make-up but duded-up. I liked my duds a whole lot better than my “Sugarfoot” outfit, which reminded me of a Buster Brown hand-me-down. Warren Oates looked properly heroic, and Millie Perkins and Jack Nicholson were clad in his and hers matching outfits—very Freudian. Jack’s outfit reminded me of Shane”. He looked not unlike Elisha Cook Jr.—in Jack Palance’s garb! Millie is one of the sweetest ladies I’ve met in show biz, but she played one of the toughest dames in the history of westerns. She was tougher than us three guys put together. She has a gentle voice. To get a tougher, throatier sound, she’d wander off and shout at the mountains. Worked for Lauren Bacall. 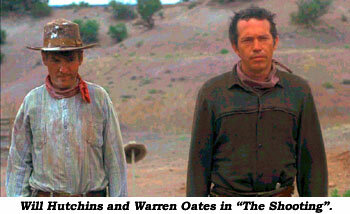 Warren Oates hauled out his git fiddle and made up songs. “Never was grapes that couldn’t make wine; never was rushes that wasn’t just fine.” Me? I’d mull over my lines. Ol’ 20 take Hutchins didn’t want to throw a monkey wrench into this well-oiled machine. We started shooting “The Shooting” at a gold mine. The first scene in the script, and we shot each scene in sequence, page-by-page, in the exact order in the script—never heard of that before or since. Have you? We had a wonderful crew headed by ace cameraman Greg Sandor. Movie secret #8,563: Get to be pals with your cameraman—you’ll come out lookin’ a lot better, and often they’re the real directors. A lot of directors are glorified foremen. Since we were strictly a non-union production, each crew member had more than one job. Some even had speaking roles. Sure wasn’t an ounce of dead weight behind the camera, unlike the situation on big budgeted productions. We were family. We had one cranky-pants crew member who fancied himself a director, and directly after director Monte Hellman shouted, “Cut—Print!,” this crew feller would allow as to how he’d have directed the scene. I told him I’d seen critics visiting sets, but this was my first experience seeing a critic on the payroll! Charlie played the ‘Bear Man’ for one scene in the middle of the desert. Of considerable girth and sporting a heavy beard, he was lyin’ in the sand, makin’ ready to die from thirst, hunger and sun. I came along afoot. I had nothing to offer, not even shade. Oh, I had a toy. A Face-In-The-box—you try to get bb’s into the eyes, ears, mouth—Remember? I gave it to Bear Man and trudged off to my doom. Just about the entire dramitis-personae end up muerte. The flick amuses, astounds, confuses, confounds. Why is it titled “The Shooting”? Which Shooting? There are five: Leland Drumm gets shot straight off. Fact, the original title was “The Terrible Death of Leland Drumm”—too long for marquees. Millie shoots her horse. Warren shoots himself (he plays his own brother). Jack shoots a bird, and he shoots me. While staggerin’ crazy-like among the rocks that look like petrified dinosaurs, I chance upon a stray hoss. I mount him and ride off like a whirlwind to rescue my saddlemate, Warren. I’m intercepted by gunslinger Jack who gives chase. Heh, heh—fastest dang hoss I ever rode. Jack never woulda caught us in real life. (As I galloped off a wrangler yelled, “Don’t be a’feared to lose your hat or grab the horn!” I did both.) For some strange reason I pull up my mount and raise my pistol. Before I can pull the trigger, Jack nails me. Now, if I had my druthers: I attack like a jouster of yore—I charge straight at Nicholson, firin’ away. Jack slows his steed and patiently waits for me to get into shootin’ range—I run out of ammo, but in my frenzy I keep chargin’. Jack fast-draws and plugs me with one bullet. Hmmm! This reverie smacks of cranky-pants crewman! Took us three weeks to complete our trek into eternity. Woulda been two, but it rained for a week. Last day in Kanab we loaded our cars and pledged eternal allegiance. Tough returnin’ to reality. Last time I saw Warren we flew to El Paso for the world preem in a drive-in. I got up on stage into the glow of headlights and told some jokes. I said, “Honk if you think I’m funny.” Last time I saw Millie was on an airplane. She played basketball player Peter Maravich’s Mom in the in-flight flick. I didn’t fork out for the headphones, but Millie was lovely as ever. Last time I saw Charlie Eastman was on the patio of a Sunset Strip hangout, Fred C. Dobbs. Ol’ Charlie stood and announced to all, friend and stranger alike, that he would give his impression of Sonja Henie. He then tied his sweater ‘round his waist, got up on his toes, and daintily skittered backwards among all the tables. He spun and spun but never left the ice, just like Ms. Henie. Last time I saw Jack was at Ciro’s nightclub. The Byrds were louder than usual. Jack danced alone, sweatin’ up a storm. He raised one arm high like a periscope as he was swallowed up in a sea of human flesh.